To manage your suppliers, navigate to Suppliers → Manage Suppliers on the Admin Panel. Here you will find a list of all your suppliers, including basic information about the suppliers and links to their supplier profiles. You can click on any supplier to view and change settings related to their accounts, like products, orders, billing agreements and product reviews. Suppliers can define their own shipping methods and choose from these options: Flat Rate, Table Rate and Free Shipping. Flat Rate and Table Rate require a handling fee. If a supplier chooses the table rate option, they need to upload the rates via CSV file so that shipping cost can be automatically calculated. If no choice is made by the supplier, the default shipping rate will be applied. Under Sold Products, you will find a list of all of the products sold by a particular supplier. In the Account Information section, you can define the Sales Percentage Fee charged by the selected supplier as well as well as setting it to either fixed or percentage. You can edit the rest of their information. 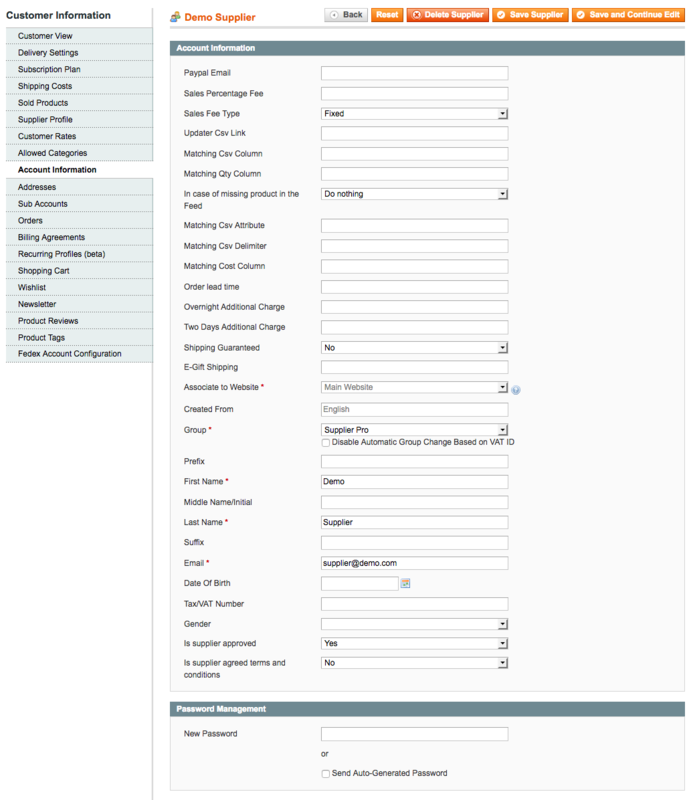 You can set a default fee that applies to all vendors, or set an individual fee per supplier separately. It possible to generate the Billing Reports for your suppliers from the Admin Panel by navigating to Suppliers → Billing Report. The Billing List displays a filterable, exportable, and detailed list of all orders and related billing information, including Vendor Id, Order Id, Date of Order, Order Status, Subtotal, Net Income, Paid Amount, and Payment Date. The Owing field displays the amount owed to the Supplier for the particular order. Green color means that it was paid in full; Red color means that payment is due. Click on the Edit link to edit or to make the payment to a Supplier or select Pay to pay them directly and amount paid already. Here you can enter the payment amount and date on which to pay the Supplier for this particular order.